The 2018 1oz Silver Maple Leaf Incuse coin celebrates 30 years of the Royal Canadian Mint's much-loved Silver Maple Leaf. It’s the first ever incuse-struck coin to be issued by the Mint and demand is sure to be high. Order today with coininvest.com to be among the first to own this special edition coin. The Silver Maple Leaf is one of the most sought-after investment coins in the world. Valued for its iconic maple leaf design and its outstanding purity and quality, it has been popular with both collectors and investors since it made its debut in 1988. To mark the 30th anniversary of the Canadian Silver Maple leaf, the Mint unveils its first incuse silver coin with a limited mintage of just 250,000. The Silver Maple Leaf's famous design gets a new look with incuse striking, a process that sinks or stamps the image into a one-ounce planchet of .9999 pure silver. Both the reverse and obverse are incuse struck to create a crisp, precise image with enhanced definition and clarity. The reverse of each 1oz 2018 Incuse Silver Maple Leaf is stamped with Walter Ott's famous maple leaf motif; except for enhanced security features, the design is little-changed since it made its first appearance in 1988. The coin's obverse features an incuse portrait of HM Queen Elizabeth II by Canadian artist Susanna Blunt. The Royal Canadian Mint is renowned for high-quality products and the 2018 1oz Incuse Silver Maple Leaf is no exception. Struck from .9999 pure silver and featuring cutting-edge security features, this supremely tradable coin is a must for collectors and investors alike. All the RCM's famous security details – precisely engraved radial lines, micro-laser engraved maple leaf, and enhanced Bullion DNA anti-counterfeiting features. 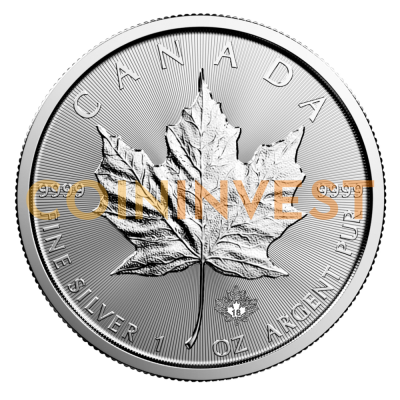 CoinInvest is delighted to present the 2018 1oz Incuse Silver Maple Leaf coin. These eagerly-awaited limited edition coins are available as singles in sachets, in tubes of 25, and in boxes of 500.